The Lake Effect is by Erin McCahan. 1. A friend of mine picked up this ARC at a book festival and gave it to me. 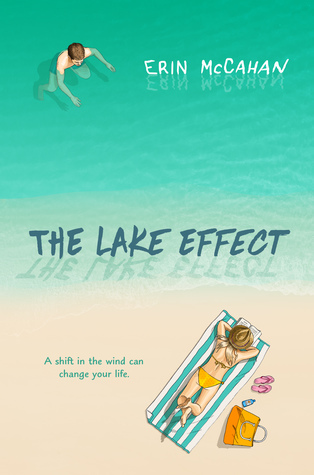 It is good coming of age story set on Lake Michigan in the summer. McCahan writes an interesting story with a quirky cast of characters. Plus, it is has quick pace to it but it does not feel rushed. 2. I kind of loved Briggs. He has some super awkward moments, which who has not had that occasionally. His interactions with Mrs. B are the best. They are funny and charming. Briggs goes through some big changes in this book, and while I liked him in the beginning, I loved him by the end watching him change and deal with the issues in his like. 3. I liked Abigail as a character. She had strange food taste, and that made her all the more charming. I did however figure out her secret that Briggs spends so much of the book guessing. 4. While Briggs and Abigail were great, it was Mrs. B that stole the book. She was funny and sweet. I loved that she dragged Briggs to all these funerals, and made notes for her what she wanted at her own funeral one day. Plus, she drops some great wisdom on Briggs throughout the book.